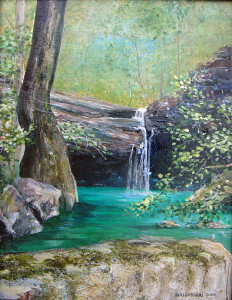 Painted mostly on location at one of my favorite swimming holes near my home place in Lurton. We often rode the mules (or the 4-wheelers) to this hard to reach location for a cool dip on a hot summers day. The way I remember it, we were always sweating again by the time we got back to the house.. The 16×20 Framed Original Acrylic Painting on canvas is in a private collection in California . 8×10 prints are available on request, matted to 11×14 with or without a frame.